The bay has been so nice to us recently. It’s been giving us some CHILLY autumn weather. 🙂 The forecast says that rain is coming later on this week. Woooot! I can’t wait for the rain. This past weekend went by so fast. I hosted a scrap/crop night on Friday for local scrappers, and we scrapped the night away. We had a lot of fun making a creative mess, sharing ideas, and snacking on munchies. In a couple of weeks, I’m hosting a scrap Fright Night; if you’re in the area and interested, please let me know, so I can add you to the list. Laura worked on layouts for a swap. As for today, it’s been one of those DO NOTHING Sundays. LOL! Maui and Hilo have just been sitting around like bums too. "We like being lazy bums. It's fun!" "Check out my new hairdo. I just got my hair cut (and a bath)!" "Do I have to take a bath too?" Today, I actually have some scrappy stuff to share. 2. Remember that if you are looking for a fun kit to work with this month, head on over to That Scrappy Girl. There’s a choice of either the October main kit (filled with Jillibean Soup) or the add on kit(filled with Pink Paislee). 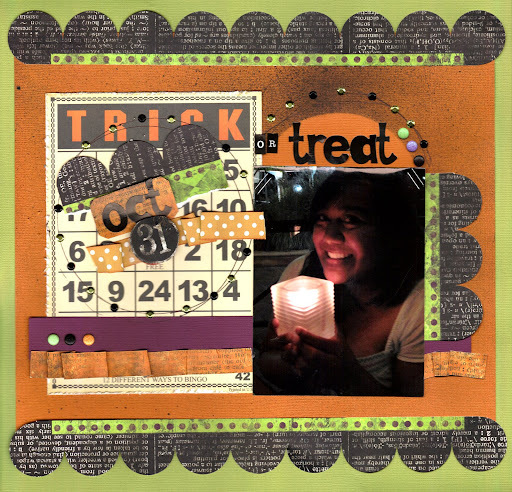 …and with the add on kit, I finished a Halloween layout and a couple of cards. I only had a chance to take a picture of one card, but I’ll snap a photo of the second one later this week. Hmmm, and I think that’s it. I might be forgetting something. LOL. love the photos and the layouts. 🙂 i love lazy sundays. i cant wait for the rain this week. I just got your comment on my blog and wanted to thank you. I just spent a few minutes browsing through your projects and your work is amazing!! Man, that is an awesome deal for those pumpkins!!! 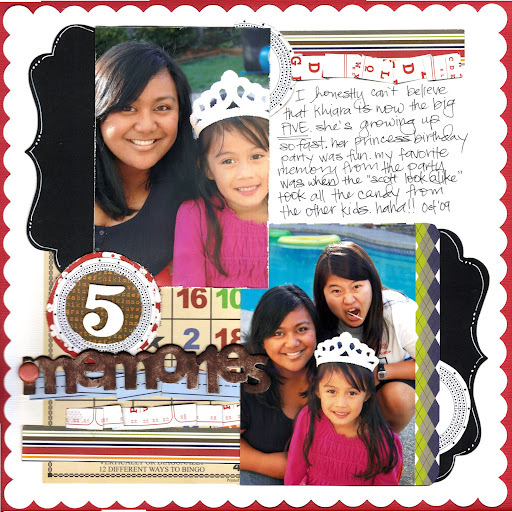 I LOVE the princess layout!!! That frog is soooo cute!!! great creations you have heer , Sarah ! especially with the Jillibean Soup kit ! Congrats on all your well-deserved opportunities – wish I could attend one of your crops or classes. Love your layous – have a great week! I ♥ all the LO’s! The Nikki Sivils team doesn’t have the Christmas or V.Day product yet, so it’s fun to see you using it! Sooo cute! Your Scrappy Girl LO’s are adorable, too! Off to check out their kits! Those are some amazing pumpkins that you guys got and saw!!! I don’t know or think we have that big of pumpkins here! LOL. I love your new PS layout, it’s adorable!!! My dogs are getting their haircut today too!!!! They always love it after they get treated to a nice cut and bath!!! Wow, you are very busy. Love all the pictures. I realy like your dogs. They are so sweet looking! Hope you had a nice week-end! p.s. : Thank you for the nice comment on my baby cards. love the layouts and especially that adorable Halloween card!!! and the crop looks like it was fun! Glad you had a great weekend, babe! How neat that you have crops at your house! Those photos are awesome. Love each and everyone of them. Great los and I also love the card. TOOO CUTE! You both seem to be enjoying a relaxful day! And you look just pawesome with your new hairdo, Maui! I LOVE your puppies!! They are so adorable. Your layouts is also very beautiful. Loving that card, my personal fav, the witch hats are just darling! loved your projects as always! the photos!!! my fave is the one with you hugging that ginormous pumpkin!!! he he! you’re soo friggin cute! i’ve been in need of some mojo! well, i’m happy you’re loving the weather! have a great week!